When skin pores are clogged with oil or debris, blackheads are formed. And when this material oxidizes, it turns dark making your skin look discolored and uneven. Blackheads can be caused due to stress, hormonal changes, sleeping with makeup, smoking, pollution etc. If you want to keep your face, especially the nose area free from blackheads, then you need to scrub your face once or twice a week, depending on your skin type. Face scrubs are one of the best homemade remedies for blackheads. No need to use blackhead tools or harsh pore strips—both of these can damage skin and even leave your pores open to more germs and dirt, resulting in more black heads! Here are four best blackhead scrubs that can help you get rid of these little nasty heads effectively at home and have healthy clear complexion. This lemon-and-salt scrub works as an antibacterial face scrub and needs just two effective blackhead-fighting ingredients: lemon and salt. Both are good at cleansing skin, leaving it bright and dirt-free. Lemon gets rid of all grime and dirt from the surface of your skin, helps to ward off blackheads, acne and whiteheads. Salt on the other hand contains antibacterial properties that kill the germs and bacteria, which can otherwise clog skin pores. Lemon: It’s a rich source of natural citric acid, which works as a natural astringent. Full of antibacterial properties that help fight off bacteria inside skin pores. Deep-cleans pores. Regulates amount of sebum (natural oil) production in skin, thereby helps in prevention of not only blackheads formation, but also of acne and whiteheads. Salt: Exfoliates and scrubs off dead cells, dirt, grime, excess oils, bacteria, and pollution from the skin’s surface. Get rid of peeling skin, leaving it smooth and fresh. (i) Mix the above ingredients in a small glass bowl. (ii) Apply this scrub on your face, using your clean fingers, and gently scrub in circular motions for 2 to 5 minutes. Don’t scrub too hard, lest you have a red inflamed face. (iii) Rinse your face with lukewarm water, and then splash cold water to close up your pores. Pat dry with a soft clean towel. You will feel your face refreshed, cleansed of all the dirt, excess oil, peeling skin, and dead cells. If your face feels dry, moisturize with a drop or two of extra virgin olive oil. (i) Make sure that you mix up to only one part lemon juice with two parts of clean water. Excess of lemon juice can irritate your skin, giving it a burning sensation and turning it red. Also never go out in sun with lemon juice on your skin. (ii) If left with any unused scrub mixture, you can store it in the refrigerator for up to one week. But throw it if it starts smelling bad earlier. Brown Sugar is gentle exfoliator as it sloughs away dead skin and makes skin completely smooth. Together with honey, they work hand-in-hand to gently exfoliate and moisturize your skin. Brown sugar is safe for all skin types, including sensitive skin. Brown Sugar: It acts as a gentle exfoliator. It not only deep-cleanses your skin, but also scours off dead cells and removes extra oil from skin surface. Contains alpha hydroxyl acids, which help to get rid of toxins and bacteria from open pores. Honey: It’s antiseptic and antibacterial. Kills germs and bacteria that clog open pores. Gently moisturizes and lubricates skin. Sticks to the blackheads in open pores and pulls them out when the face scrub is removed. (i) Mix well both the ingredients in a small glass bowl. (ii) Apply the mixture onto your clean with the help of your fingers in circular motions. Keep scrubbing for about 5 minutes. When you’re through, rinse it off with warm lukewarm water. (iii) Rinse your face with lukewarm water, and then splash cold water to close up the pores. Pat dry with a soft clean towel. You will feel your face refreshed, cleansed of all the dirt, excess oil, peeling skin, and dead cells. Pat dry with a soft towel. If you feel your skin is dry, moisturize with a drop or two of extra virgin olive oil. 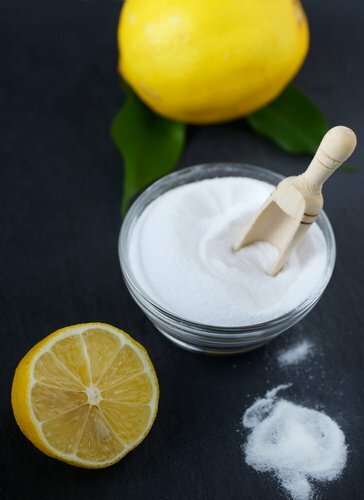 Baking soda has abrasive properties and that is why it can be used to remove whiteheads and blackheads. (i) Mix well the three ingredients in a small glass bowl. Apply the scrub on your face concentrating more on affected areas such as nose and chin, leaving it on to let it semi-dry. (ii) Once the mixture is semi-dry then scrub it gently in circular motions for 2-3 minutes using little wet fingers. In this process, the scrub will remove dead skin and blackheads by unclogging pores. Finish with applying a little toner. (iii) Repeat the above process once or twice a week. Oatmeal exfoliates skin gently and it is also natural absorbent which removes excess oil from face thus prevents blackheads formation. (i) Ground the oatmeal and mix well with above two ingredients in a small glass bowl. (ii) Scrub the mixture on your face in circular motions for about 2-3 minutes, using your clean fingers. Leave the scrub on for about 10 minutes before rinsing it off with lukewarm water. (i) To get best results steam your face just prior to using blackheads removing face scrub. A facial steam will help open up skin pores and soften your skin, facilitating the blackheads to come out easily. (ii) Refrain from touching your face with hands as it can lead to acne breakout and formation of blackheads. (iii) Don’t use harsh cleansers and soaps. Many store bought face cleansers contain high amounts of chemicals and sodium lauryl sulfate (SLS), which strip your skin of natural oils. To compensate your skin tends to over produce sebum (natural oil), which can clog your pores causing formation of blackheads. (iv) Neither get into the trap of over-washing (many times during the day) or over-scrubbing your face with blackhead face scrubs more than twice in a week – thinking that it would remove blackheads fast. In fact, over-washing or over-scrubbing your face will give your more blackheads, not to mention acne and white heads. Why so? Well, both practices strip away most of the natural oils, provoking your oil glands to produce more oils, and excess oil is one of the causes of blackheads. Enjoyed reading this post and seeing the natural remedies to help the skin. Thanks for sharing. Is baking soda safe to use on face with pimples? I will try the brown sugar remedy for blackheads, hope it works!